Wu Yi Yan Cha, also known as “Rock Wulong”, is a special subcategory of wulong tea grown in the vicinity of Wu Yi Shan City in northern Fujian Province. 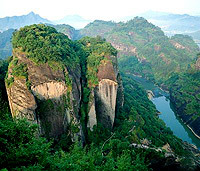 Wu Yi Shan is an UNSECO World Heritage site, and it is internationally recognized and protected for its biological diversity and significance as an ancient cultural site. The area has an extensive history of tea production. In fact, it was the farmers in Wu Yi Shan who developed the methods for making wulong tea around 1650. Even to this day, Wu Yi Shan’s wulong tea, referred to as “Yan Cha” or “Rock Tea”, is considered by many to be the preeminent style of wulong tea. More so than any other famous tea, understanding Wu Yi Yan Cha is inextricable from examining the intricacies of its growing region. Wu Yi Shan has a long history of producing famous tea. Nothern Fujian ascended to fame as the foremost tribute tea producing region during the Song Dynasty (960-1279 AD) when the fields and factories of the region were recognized as the producer of the nation’s best quality tea and hosted the epicenter of the government controlled tea industry. During the Song dynasty, all tea was essentially green tea that was compressed into cakes during its manufacture. The compressed tea from Wu Yi Shan was so sought after that it was renowned to be worth more than its weight in gold. The arrival of the Ming Dynasty (1368-1644 AD) forced Wu Yi’s craftsmen to change the way they made tea from the compressed form to the loose-leaf form we recognize today. It was around this time that the emperor ordered the ceased production of compressed teas in an attempt to arrest the corruption centered around the tea trade. This limited people to the production of only loose leaf tea. With much difficulty in adapting to this new standard of production, Wu Yi Shan slowly retooled its infrastructure and began to make loose-leaf green tea. In an attempt to copy the technique from successful tea producers in Anhui, producers of Wu Yi Shan, unfamiliar with process of pan firing green tea, inadvertently allowed their tea leaves to oxidize. These imperfect efforts at making loose leaf green tea sired the creation of partially oxidized wulong tea and fully oxidized black tea in Wu Yi Shan at the end of the Ming. Wu Yi Shan continues to produce the world most sought after wulong in the form of its famous Yan Cha. Throughout a history spanning dynasties, tea scholars have been attracted to the biologically diverse and unique climate of Wu Yi Shan. Even when the Scottish Spy, Robert Fortune, smuggled the first tea bushes out of China, he traveled to Wu Yi Shan to take his samples. In the last 1000 years, hundreds of varieties of tea bushes have been identified as growing in Wu Yi Shan. Out of these hundreds of bushes, Da Hong Pao, Tie Luo Han, Bai Ji Guan, Shui Jin Gui are considered the Four Famous Wu Yi Wulongs. Of the four, Da Hong Pao is unquestionably the most famous. What are considered to be the mother bushes of Da Hong Pao still live in the cliffs of Wu Yi Shan, and are now over 350 years old. Since Wu Yi Shan has so many bush types, the famous teas are always produced in small quantities. They will never be truly common products–at least the tea grown inside the mountain range won’t. However, there are a lot of areas in the surrounding mountains that produce larger quantities of these cultivars. The most common of these rock wulongs is Rou Gui, a cultivar that some locals rank as better than the more famous teas. The temperature averages 18C though the year, with a short frost time that won’t kill tea plants. Precipitation is abundant and the region is almost always in a shroud of fog. The humid conditions (80% humidity on average) keeps the soil moist and the bushes healthy. Besides the humidity, the cliffs are continually shedding minerals into the soil. Even though Wu Yi Shan’s elevation averages lower (650M) than other high quality tea growing regions, its ideal temperature, soil and weather more than compensate. Hundreds of boulders, some the size of a small mountains, are spread throughout the area. There are ninety-nine large rock faces in the center of Wu Yi mountain, the Zheng Yan Cha growing area, alone. The Zheng Yan Cha growing region is defined by two rivers encircling the heart of the region. There is a myth that a princess was separated from her lover by a monster, all three represented by towering rocks. The princess and her lover are two tall monoliths, separated by a large plateau. The monster is the plateau, and it has many valleys scarring it. It is within the monster that the best teas grow, on its back and in the narrow, cliff-sided valleys in between. The particularity in Wu Yi Rock wulong’s manufacture has given rise to a specialized vocabulary of terms used to describe the tea’s attributes. The attributes of these teas were usually determined by the region the tea grew in by proximity to Wu Yi Mountain. The government has since barred the use of these terms citing predatory marketing driven by the specialized nature of judging the soil differences in these regions. You’ll likely see how confusing it could be for a consumer to judge the authenticity of their tea by these terms alone, but it is interesting to read about them. Commercially, Wu Yi tea is typed by growing region: Zheng Yan Cha, Ban Yan Cha, and Zhou Cha. Zheng Yan – “Center rock tea.” The soil consists solely of weathered rock soil. The soil composition changes out side of this region creating a noticeably different flavor from tea grown inside of it. Ban Yan – “Half rock tea.” On the edge and in the surrounding foot hills of the Zheng Yan area. The essential qualities of yan cha flavor are less apparent than tea grown in Zheng Yan but are still recognizable. Besides growing the famous cultivars, this is the place where many not so famous teas, but still mysterious and special in their own right are grown, like Shui Xian (Narcissus) and Ba Xian (Eight Immortals). Zhou Cha – “River bank tea.” Tea grown near the banks of Zhou and Huangbo Rivers. The quality is considered to be half that of Zheng Yan teas. * Gan 甘 – “sweetness” – Emerging in the back of your throat and sides of your mouth, esp. a sweet aftertaste. * Qing 清 – “purity”– Clean clear translucent liquor. * Xiang 香 – “fragrance” – Gentle, muted, arrives slowly, not sharp, deep. Not overwhelming, not mawkish, or too perfumed. * Yan Gu 岩骨 – “rock bones” –The tea has such depth of flavor it’s like you’re eating some kind of meat.